Hi! My name is Bill Giles. This is my storm chasing blog. There are many like it, but this one is mine. Writing this is really weird for me. I’m usually a lot more guarded, bordering on downright antisocial sometimes. Those of you I have as Facebook friends may have noticed this by my activity level, as I average about five posts a year. Well, until recently I guess. This blog is an attempt to try something new. I’m going to share stuff…maybe too much. So here we go. I was a morbid child. I was (and still am) fascinated by anything that could kill you. Venomous snakes & spiders, awful diseases, natural disasters like volcanoes, earthquakes, and tsunamis. Nuclear weapons too. 1I was an 80’s kid. Mutually Assured Destruction was a thing back then. I devoured books about Bad Things. I went through a Greek mythology phase too, which really doesn’t pertain but it was a thing I guess. The number one interest was always severe weather for me, specifically tornadoes and hurricanes. I couldn’t get enough. I’d flit back and forth with my other doom and gloom interests but I always came back to tornadoes and hurricanes. As I got older this evolved into a healthy respect for weather in general. Hurricanes were cool, but I didn’t seem likely to just stumble into one, living in Arizona. Tornadoes though….I knew they could happen anywhere. I think this picture more than anything is what fascinated me as a kid. 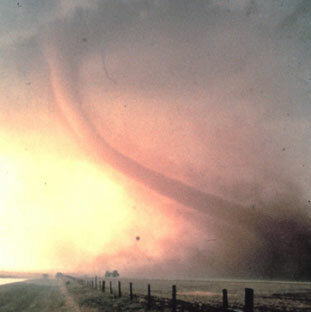 This is a tornado roping out near Cordell, OK on May 22, 1981. Wow. This film clip still fills me with awe. The 8mm film and the loose soil make this tornado look almost sinister. This is the Ash Valley (Great Bend) Tornado on August 30, 1974. I wanted to see a tornado so badly when I was young. If a storm went severe warned anywhere in Arizona I would go outside and look around, like it was coming right for me. Even if it was out in Kingman or Tucson, miles and miles away. I’d watch the Weather Channel for hours, the old version when it mostly just text, temperatures, and elevator music. I was a dumb kid. My sister made fun of me. When I was around 7 years old I wrote to the National Weather Service to be a Skywarn spotter. They agreed (or they humored me) and sent me some information and a spotter ID card that I have long since lost. Too bad. If they tracked spotter ID’s in those days I bet I have a really old spotter ID number. I never saw a tornado while I lived in Arizona though. When I was 10 I went to Idaho, and I thought I saw one way out in the distance while on a day trip with my dad. Thinking back, it might have been a landspout. Or simply a scary looking cloud. It’s been a long time. But that was the closest I came. the sun trying to kill you for most of the year. in late October or November it finally cools off and is very nice outside, attracting old people. This lasts until about mid-April, then it’s back to murdersun. The weather is hardly boring though. In late June the monsoon season begins and it lasts until around the end of September. As a kid this was the closest I could get to tornadoes. Here’s how a typical monsoon day plays out. White, fluffy clouds appear in the distance in the early afternoon and grow closer and loom larger and more ominous as the day progresses. In the evening the sky turns brown, the wind picks up, and your car is suddenly dirty and your lawn furniture goes missing. Many of these storms wouldn’t produce rain though; the Phoenix metro areas acts as a gigantic heat island and seems to tear most of the storms apart. But occasionally the storm will win and it just pours. Now all of that dust from earlier glues itself to your car. Repeat this every 1-5 days until the end of September. In the late 90’s I started following Stormtrack.org. I’d read posts and admire photos that chasers posted 2Video came a lot later; Internet bandwidth just wasn’t there back then.and tell myself that some day I would actually Get Out There and Do This. But it was mostly a dream. The movie Twister came out in 1996 and after seeing it in the theater I just knew that there was going to be a lot more people out there. Maybe I missed the boat? Time passed. I threw myself into my career and worked a lot; probably too much. I didn’t take vacations unless I was in danger of losing my time off, and even then I’d usually just pad a weekend with a vacation day here and there. I couldn’t take long vacations. I work in Information Technology and my employers always had something to implement, fix, or upgrade. …I would be lucky to get a single day of chasing in before having to drive home to go back to work. The odds were way against me ever succeeding. My “vacations” would consist of driving to my destination, then racing home after glancing at it. I might as well drive to Disneyworld in Florida, hang out in the parking lot for an hour, then drive home. I decided that it wasn’t going to happen and I shelved the whole idea. More time passed. The Storm Chasers reality show came out and a lot more people caught the bug. I didn’t even really bother to watch it. I was too busy for that sort of thing now, and it was actually kind of depressing. So much for my dream. In 2013 the company I was working for went bankrupt and collapsed. 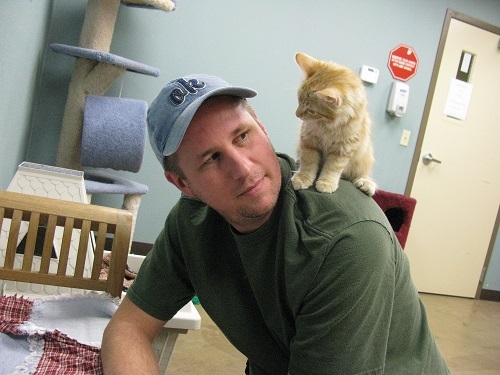 I was laid off along with most of the other employees. I decided to take some time off and really decide what I wanted to do. I wanted…needed a change in my life. I wanted to get out there and do something that I’d always wanted to do. I wanted to see tornadoes dammit, and I want the opportunity to do it right. I decided that I needed to move. Moving to Tornado Alley wasn’t really an option for me. I wanted to be close enough to drive out, see the show, and then go home. I don’t want to ride the tornado ride and have my house destroyed. 3You have no idea how bad my luck is; This is a legitimate concern. So where to move? Thinking back, I lived in northeast Arizona for about five years, in a small town named Greer. Adjusting to small town life wasn’t easy, to say the least, but the part I liked about Greer was living in the mountains. I started hiking mostly just to get out of the house and away from my dumb teenager problems, but I grew to really enjoy it. I realized that my girlfriend and I could move to eastern Colorado and live near the action. Denver is a large technology hub so we could both continue to work in our field. We’d both get our mountains and trees, and I’d get quick access to the Great Plains. We sold our house and moved to Centennial, Colorado in August of 2015. Shortly after arriving I started to really dig into what I would need to learn to be a successful storm chaser, instead of just browsing. It turns out that actually catching a tornado is surprisingly difficult, not to mention taking quality pictures and video while keeping yourself safe. High winds, lightning, hail, flash floods…even just driving the crazy distances needed to get to your target add risk, and the actual tornado is near the bottom of the hazard list. I’ve been learning how to read radar, make basic forecasts, interpret weather models, educate myself on how supercell storms work, keep myself and anyone with me safe, purchase gear, and learn storm photography…all at the same time. I went and got my Skywarn spotter ID in early spring of 2016 as well. It’s a start. So there you are. I finally have a hobby that isn’t work and I’m really enjoying it. Well, that’s that. If you’re still reading, keep going! I hope you enjoy it. Maybe you’ll get something useful out of it, or you can just use my experiences as a list of Things Not To Do.